This article seeks to discuss "Scientific consensus" as it is understood today and how, in the past, scientific consensus has had to undergo seismic shifts. Intelligent Design is repeatedly dismissed by its critics as being unscientific. Many who make this assertion are not suggesting that it has no empirical data to support its claims but rather that it is completely outside the realm of science. This is because of a narrow definition of science that has been developed. What is scientific, according to this definition, is a matter of ongoing debate. Google “problem of demarcation” and you will get some idea of the extent of this discussion and the difficulty of determining where the parameters should be set. Others, of course, who dismiss ID do so because they believe that it has no merit. Whether this is based on their philosophical prejudice or their scientific convictions can be hard to tell but they are utterly dismissive and refuse to treat ID seriously. A quick glance at the comments posted in response to ID articles will illustrate the derisory attitude and the scorn that is heaped upon those who dare to hold a different opinion. The Centre for Intelligent Design is well aware that the scientific consensus does not accept ID as science. That is the reason for our existence. It is our purpose to challenge the lines of demarcation that currently prevail. These are not constant and have changed throughout the history of science and should continue to change as our understanding develops. The Centre for Intelligent Design wants to move beyond the mocking contempt that is often expressed and have the empirical data properly considered. Scientific consensus sometimes get so entrenched that it becomes a hindrance rather than a help to the advancement of science. Galileo Galilei had a bit of a run in with the consensus and concluded, “In questions of science the authority of a thousand is not worth the humble reasoning of a single individual”. His scepticism of consensus is understandable when you consider the way in which he was treated. Sadly, Galileo is not the only one to have had his ideas dismissed by the scientific consensus. In 1847 Ignaz Semmelweis discovered that disinfection of the hands significantly reduced the incidence of puerperal fever in obstetric clinics. Puerperal fever was the single most common cause of maternal mortality in the 18th and 19th centuries. However, the scientific consensus did not accept Semmelweis’ empirical evidence but dismissed his findings, often with contempt. He did not accord with the established opinion of the day and was considered by some to have no scientific basis for his claims. Others were insulted by the idea that their hands were being described as “dirty”. It was also pointed out that Semmelweis was saying nothing new. In 1843 Oliver Wendell Holmes, had published an essay on the contagiousness of puerperal fever but his views were attacked by the scientific establishment. Sadder still is the fact that in 1795, Dr. Alexander Gordon had published a paper on the contagious nature of puerperal fever and the importance of the right hygiene practices in order to prevent its spread. His paper acknowledged the strong opposition he confronted and the attempts to suppress the truth. How many lives could have been saved if the scientific consensus had not been so stubborn? Nobody in the scientific establishment today would dare to describe the findings of Gordon, Holmes or Semmelweiss as stupid but it was not always so. Between 1906 and 1940 there was an epidemic of pellagra in the United States with some 3,000,000 cases reported and 100,000 deaths. In 1915 Dr. Joseph Goldberger discovered the cause to be directly linked to poor diet but his empirical evidence was vilified by those who were persuaded the disease was caused by infection. The scientific consensus said no! They leaked some of his secret research to the news media and then impugned his motives. For 25 years an epidemic continued that could have been prevented and offers of federal help from the President were refused. There were major political and social implications involved but surely the scientific establishment were not influenced by these? Perhaps you might investigate the issue yourself to judge whether or not the scientific consensus is ever influenced by factors outside of empirical data. 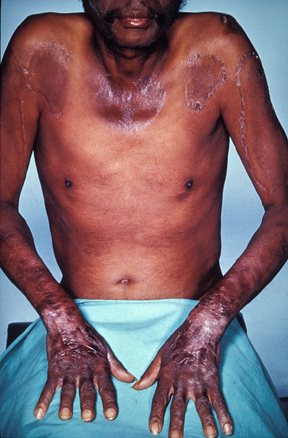 See http://en.wikipedia.org/wiki/Pellagra for more details of this disease and also the image at the end of this article. On January 6th 1912, Alfred Wegener presented his hypothesis on Continental Drift but the scientific consensus was unimpressed. He was unable to support his circumstantial evidence with a specific mechanism that explained it. He speculated that centrifugal force might be responsible or the astronomical precession. In spite of the opposition of the scientific consensus he continued to develop his ideas and a symposium was specifically organised in the United States in opposition to his hypothesis. In 1943 the noted palaeontologist George Gaylord Simpson strongly attacked Wegener’s position in the American Journal of Science and this influenced those who had been sympathetic to change their views. Once again the scientific establishment backed the wrong man. Wegener’s inability to posit the right physical mechanism did not mean that his hypothesis was wrong, but it was the primary reason the consensus was against him. In addition he committed the cardinal crime of not actually being an expert. Wegener was not a geologist so his evidence apparently lacked authority. The history of science is littered with occasions when the scientific consensus has wrongly challenged the minority voice and in so doing has impeded the progress of science. Obviously any scientific theory has got to be robust enough to withstand the most detailed scrutiny and inquisition. However, the examples cited demonstrate that time and again the problem was not with the empirical evidence. Closed minds, personal offence, political and social constraints have all played their part in preventing proper consideration of the data. This was then exacerbated by the way professional credibility was questioned, motives were misrepresented and individuals were vilified. Although Intelligent Design theory is not accepted by the scientific consensus, its proponents are often asked to list the peer reviewed articles that are in its favour. While there are in fact some such papers, contrary to critics’ claims, the reason that there are not more will be obvious to any intelligent reader. The scientific establishment has not always proved itself to be in open and objective pursuit of empirical evidence. The US Supreme Court in Daubert v. Merrell Dow determined that the peer review process could be flawed in certain circumstances. Research by Rothwell and Martyn also raised questions about the credibility of the process and Casadevall and Fang, though offering no sympathy to ID acknowledge, “In fact studies of peer review have identified numerous problems, including confirmatory bias, bias against negative results, favoritism for established investigators in a given field, address bias, gender bias, and ideological orientation”. The Centre for Intelligent Design seeks to promote the scientific data with inference to the best explanation but recognises that there will be those who seek to avoid interacting with the actual arguments while hiding behind claims of consensus.